Seoul is an exciting city with so much to see, do (and eat and drink) that even those on a short visit can easily pack in a lot of sights and attractions without feeling rushed. But if you have more time, one of the best ways to discover South Korea’s capital is to explore the city’s wide array of diverse neighborhoods, offering everything from art and culture, to history, shopping and nightlife. Whatever your interests are, there’s an area that’s worth a visit. Read on for a look at 10 must-see neighborhoods in Seoul. Love to shop? Put Myeongdong on your must-visit list in Seoul. This is one of the primary shopping districts in the city (for both locals and visitors) and sees a whopping one million visitors pass through the area every day. But don’t let that number deter you; getting there and around isn’t nearly as chaotic as it might sound. The streets may be busy, but getting around doesn’t feel overwhelming. Here you’ll find a good mix of both Korean and North American brands, as well a plethora of Korean skin care and beauty-focused shops where there will be samples aplenty if you ask for them. Myeongdong is also a great place to fill up on Korean street food both sweet and savoury. The entire shop-filled area stretches from Shinsegae Department Store to Lotte Department Store, and along Cheonggyecheon Stream to Myeongdong Subway Station. With its colorful winding streets and alleys filled with bars, street art, cafes and restaurants and the area’s international vibe, eclectic Itaewon is a great neighborhood to base yourself or to spend time in on a visit to Seoul. Itaewon was the first special tourist zone in Seoul, designated in 1997, and where you’ll find a high concentration of expats, giving the neighborhood its multicultural feel. You can get almost any type of cuisine you’re craving here, from Italian to Greek and everything in between, in particular among the rows of international restaurants right behind the Hamilton Hotel. Itaewon is also home to Antique Furniture Street filled with over 100 shops selling unique pieces of antique furniture and home décor items. Another shopping-centric neighborhood, Dongdaemun, consists of over 20 shopping malls and 30,000 traditional shops and markets, meaning that no matter what you’re on the lookout for, you’re likely to find it here. And the best part is, you can shop into the wee hours of the night as many locals like to do. Dongdaemun covers the entire area around Dongdaemun Gate, and even if you aren’t in the mood to buy, the neighborhood makes for a fun area to walk through. In addition to all of that shopping, this neighborhood is also where you’ll find Dongdaemun Design Plaza (DDP), designed by world-renowned architect Zaha Hadid and home to museums and galleries offering a variety of cultural experiences and exhibits. For something a little off the beaten path, wander up the road behind Dongdaemun Gate to Dongdaemun Seonggwak Park for a bird’s eye view of the city below. Looking to find a few local souvenirs from Seoul to take home with you? Insadong is an ideal place to do it. The main street features a plethora of shops specializing in a wide variety of traditional Korean goods, including hanbok (traditional clothing), hanji (traditional paper), pottery, tea and crafts. That being said, the neighborhood’s winding alleyways are a wealth of teahouses and quaint eateries, so give yourself some time to explore slowly so you don’t miss anything. Art lovers will also want to put Insadong on their must-visit list — there are about 100 galleries in the area showcasing traditional Korean fine art. When you get hungry, the area is known for its ample array of places to eat, including Sanchon for vegetarian food and Gogung for Korean staple bibimbap. You may be familiar with Gangnam thanks to the ultra-popular song and accompanying viral YouTube video from several years ago for “Gangnam Style” by PSY. But if you’re not (or you just know the song and not anything about the area), Gangnam, which means ‘South of the River,’ is the district that lies along South Korea‘s Han River. One of Seoul’s busiest areas, Gangnam is packed with high end shops, malls, restaurants and cafes. The affluent neighborhood is also home to COEX Mall, the largest underground shopping center in Asia, located in the basement of the Korea World Trade Center. Located near four universities, Hongdae offers an exciting blend of boutiques, live music venues, cafes, bars and clubs creating all the buzz and excitement you can expect from a university-centric area. During the day, stop by to do some shopping or some people watching at one of Hongae’s many cute cafes. In the evening, the neighborhood is known for its vibrant club scene — so if you’re a night owl, this is the place to be. You’ll also find lots of Instagram-worthy street art in Hongdae, as well as the Hongdae Free Market, held every Saturday from March to November at Hongik Children’s Park and featuring handmade products of all kinds. Sports fans might want to make their way to Jamsil, a neighborhood that’s home to two professional Korean baseball teams: the Doosan Bears and the LG Twins, which both play at Jamsil Baseball Stadium. The stadium also hosted events during the 1988 Summer Olympics in Seoul. Jamsil is also home to Lotte World, a massive entertainment complex where you’ll find the world’s largest indoor amusement park, an ice rink, stores, restaurants, a folk museum and even a lake. 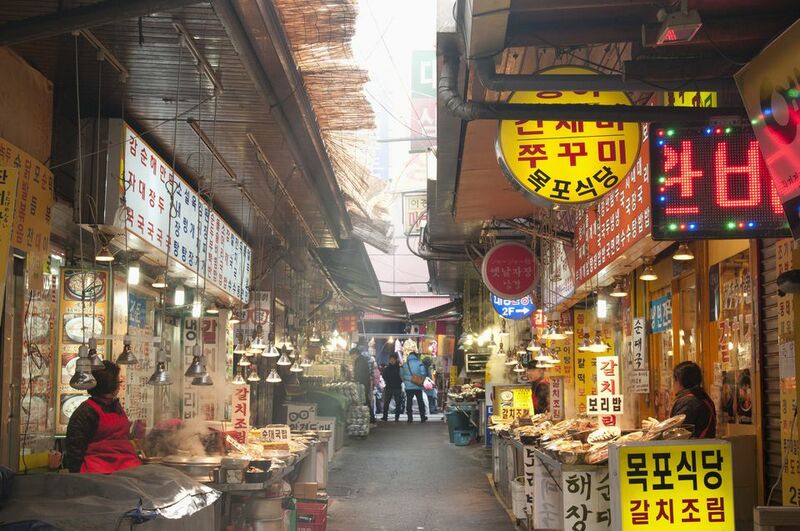 This area is where to go to shop at Korea’s oldest and largest traditional market, also named Namdaemun. The market and the greater Namdaemun area are named after the large gate located nearby, which is one of eight majestic gates you'll find in Seoul along the city’s Fortress Wall. The market itself is a twisting maze of stalls spread over several city blocks, making it fairly easy to get lost — but that’s half the fun. Take your time wandering the crowded tangle of stalls and shops, stopping to buy and browse among locals and sample some street food when you’re hungry. This charming neighborhood in central Seoul is where to go to get away from the faster pace you’ll often feel in other areas of the city. The peaceful, residential area offers views of the surrounding mountains of Inwangsan and Bugaksan, and is home to many art galleries, museums (including Seoul Museum and Whanki Museum), coffee shops and restaurants. Stake out a spot at Sanmotoonge (which means Mountain Corner), a popular coffee shop with amazing views over the mountains. Samcheong-dong is where you’ll find Bukchon Hanok Village (Hanok are Korean traditional houses), a great place to learn about traditional Korean culture. The charming neighborhood is also home to forty different galleries, which art-lovers should make a point of visiting, as well as European-style cafés and unique shops, some of which reside in renovated hanok.